In 2004, Steve and Marie Nygren opened a bed and breakfast in the area that started their venture into forming the community of Serenbe. Marie named the town in reference to the serenity of the location. The development is an example of New Urbanism. The homes were built with front porches but no back yards so that the focus would be on trails and shared green-spaces. Shops and dining was built in close proximity to homes to encourage more walking and a sense of community. 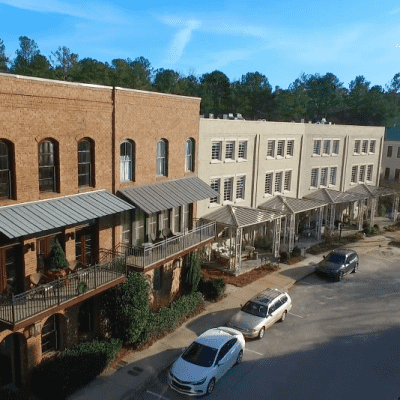 The Inn at Serenbe is a must see for anyone wanting to really get a feel for what the town has to offer. While hiking through the 15 miles of trails, you can take in the 900-acres of preserved forest and sneak a peek at the two waterfalls. While outdoors, you can make your way through the Labyrinth, which is a large granite outcropping with rocks from all over the world. Then you can end your day by the pool cabana and enjoy a top-notch meal.